First off-- THIS!!! Rockwell is where you want to be headed this weekend. 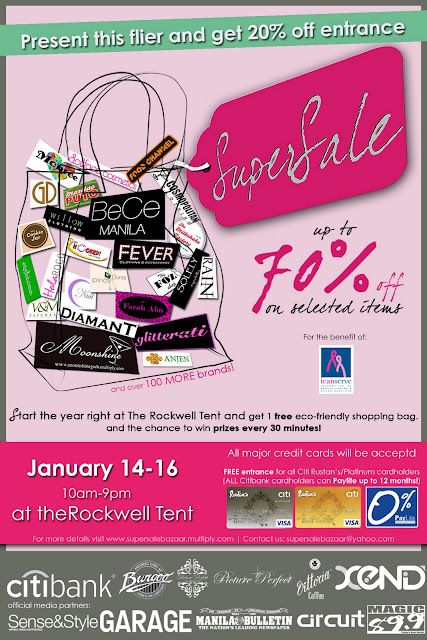 SuperSale Bazaar and Citibank invite you to the Biggest Pink Tag Sale. Join us as we START THE NEW YEAR RIGHT! and the chance to win exciting prizes every 30 minutes!! you're sure to find the great deals you're looking for. There's something to fit EVERY BUDGET!! Credit cards WILL be accepted throughout the entire bazaar. and best of all you can PAYLITE!!! And here's another great news... Forever 21 is opening in SM Makati on April 8!!! This is according to my friend who works for SM (shoutout to Mau!). Now you don't have to fight off others just for that beautiful pair of shoes. At least they now have 2 branches you can shop at. Lol. I'm also done shipping out Archive packages + some from my holiday giveaway!!! :) Can't believe I shipped out 17 packages today. Kuya JAM went cray cray computing. And I also went cray cray packing! My hands are now stiff as a board from writing receipts. So, that's it! Back to work. Baboosh! Waaaaa I see Herve Leger!! I'm so jealous! I wanna go to Rockwell. for me and my friends, pleaaase? Really in SM Makati? That's goodnews to hundreds of F21 fans (including myself) LOL :) Thanks for the info! next to open is a cebu branch na...then i'll be dead from tooo much shopping...they might have to break my CC free from my hands..LOL. love the outfit! :)I wish I have time to visit the bazaar! Yaaay! Another branch for F21! \:D/Can't wait! Hi Aisa! I'm coming over to the bazaar tomorrow with my boyfriend, brother and 2 nephews. :) Do they also get free passes? Let me know please. :) Thanks! P.S. For the others - I already forwarded your names to the organizers:) Thanks! got my package today! yey! i'm bringing 3 of them with me to my trip. thanks Pax! love it all!! !